Everyone sees dark under-eye circles on their face from time to time; and you are even more susceptible to them if you live a stressful lifestyle or if you don’t get enough sleep. Unfortunately, they are tough to remove without some additional help. Dermalex MD is a safe, non-prescription cream which may lighten dark circles and refresh the look of your face. Make sure you only apply Dermalex MD to skin that is already clean and dry for best absorption. Apply twice daily: once in the morning under your makeup, and once at night before bedtime. Eyeliss may help reduce puffiness and sagging, therefore making dark under-eye circles harder to see and eyes looking more radiant. Puffy eye bags and dark circles can make you look tired and sometimes unhealthy, even when you’re fully rested or in top shape! This can be especially noticeable on pale or fair skin. 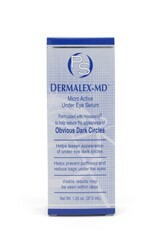 Dermalex-MD may help lighten dark circles to promote a healthy appearance. Try it today!